The Evil Following MB is billed as a 120mm 29er trail bike that’s capable of far more than its numbers would indicate. Evil’s Following, featuring the highly refined DELTA single-pivot suspension, blew away preconceived notions four years ago as to what a 120mm 29er trail bike could be. Now the Evil Following MB has upped the game with the same 120mm of rear travel and berm slashing 430mm chainstays, but 20mm more reach (now 452mm size large). But in today’s increasingly aggressive landscape of flow, enduro, and bike park trails, can the Evil Following MB still hold its own? This iteration is definitely better than is it’s predecessor, but is that enough? In pockets where it’s popular (as in my Pacific Northwest home base), Evil has a cult — er — following. And after having spent months putting an Evil Following MB through the paces, it’s easy to see why. Released last fall, the Evil Following MB brought numerous upgrades to the original. Foremost is trunnion shock mounting, which provides a roomier cradle for piggyback and coil shocks. 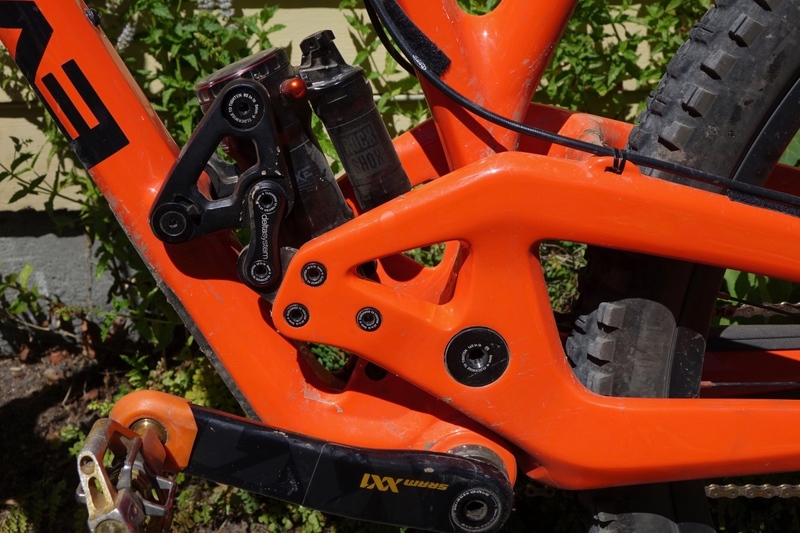 The Evil Following MB also checked the boxes of boost spacing, plus-tire compatibility, threaded BB, bottle mount inside main triangle, built-in chain guide, and slightly longer reach and wheelbase. Our tester getting a little hang time with the Evil Following MB. Getting on an Evil Following MB (as in More Better’er, one of many tortured nomenclatures the brand manages to pull off to minimal protest) changes the way one rides. The bike is so quick on acceleration, so fast through the turns, and so lively over all kinds of terrain, it requires a reset of style and expectations even for seasoned riders who thought they’d seen it all. 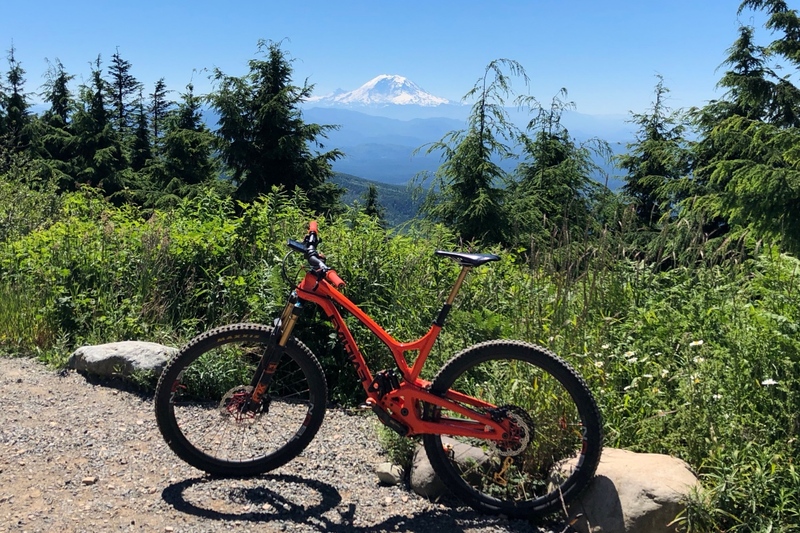 On classic high-country singletrack, on flow trails, in bike parks, and even errands over pavement to the grocery store, there’s nothing this bike doesn’t love to do and won’t make you giddy doing it. 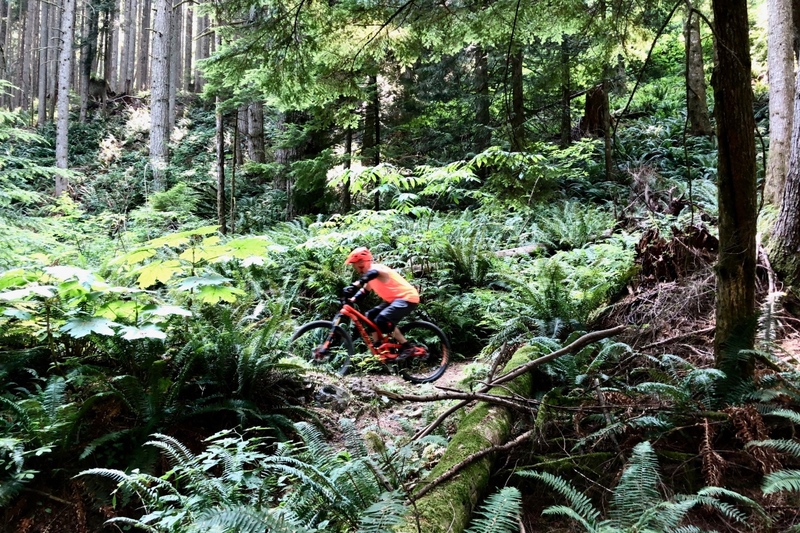 Key to Evil Following MB euphoria is body position, especially on berms and the steeps. This bike loves you in the center of the frame. You don’t want to be too far forward — lest the active rear end goes rogue on you. And if you’re too far back, the bike loses its pop and front-end control and traction. There’s lots going on down under, requiring vigilant maintenance. Indeed, the more you stay swaddled in the cockpit, the happier the Evil Following MB is. It corners like an F1 racer, crushes rubble like a cement truck, and catches air like a parasail. And when you need that extra burst over a step-up or around a switchback, when you want to manual or just avoid trouble, the Evil Following MB has a built-in afterburner to boost you through. All of this comes in a lovely package. Not since the original Ibis Mojo has a mountain bike offered such distinctively alluring lines. You may not know at a glance which Evil model you’re looking at, but you immediately know it’s an Evil. 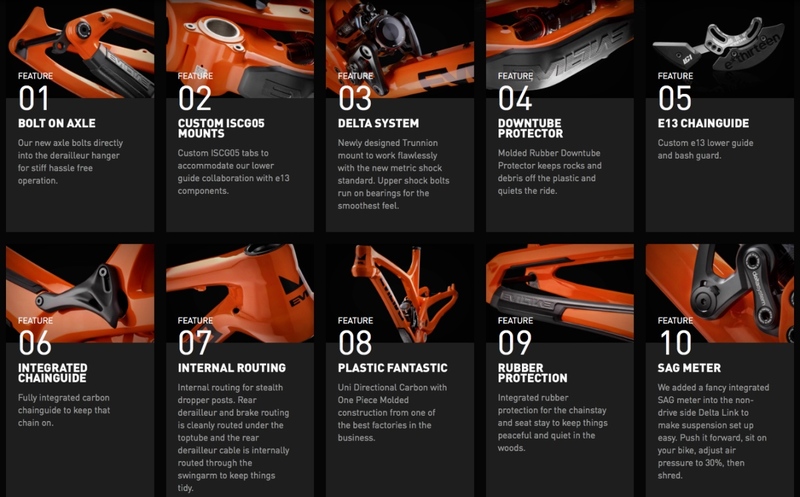 It all adds up to what may sound like the most perfect bike in existence. But here’s the rub: mountain bikes are always evolving, and there are always tradeoffs. With trails getting steeper, faster, gnarlier, and otherwise more challenging, the Evil Following MB’s vaunted liveliness can work against it. Its suspension certainly feels deeper than 120mm, but it isn’t bottomless. If you over-gun, you’re quickly penalized on the transition with a fish-tail or stutter landing. It’s also easy to lose track of the rear end in the air. ENVE’s all-carbon cockpit helped lighten the Evil Following MB and extend its geometry. Part of this is the single-pivot foundation. We’ve come a long way since the brake-jack days of the Y-33 and Superlight, and Dave Weagle’s genius has done wonders to counteract single pivot twitchiness. But even the DELTA wants to rebound/ramp as fast as it can. In the air (on flow trails — we’re not talking A-Line here) was the only place I found myself wanting to move back from the middle of the bike to maintain control on landing. But going aft can compromise control. Key features of the Evil Following MB.Click image to enlarge. A coil shock — not yet available for the Evil Following MB — might help here. Evil fans rave about coils on the Wreckoning, Insurgent, and Calling, and a coil is rumored to be on the way for the Following. My suspicion is that a step-up in travel to 140mm might also aid in stability. The Evil Following MB is a good, but not a great, climber. The size Large frame’s seat angle (73.7 degrees in x-low mode with a 130mm fork) is pretty slack by today’s standards, putting the rider a bit back on climbs. Adding to the equation is a fairly low front end (I ran out of headset spacers even when I went to a 140mm fork) and compact wheelbase. The cockpit seemed cramped no matter what I did — extending the stem, slamming back the saddle. Reaching the shock o-ring through the Evil Following MB’s rear triangle to set sag takes some practice. I finally settled on a 55mm, 6-degree-rise stem with 780mm bars and a centered saddle, but the Evil Following MB’s geometry simply doesn’t allow for optimal climbing. Nor is the bike particularly light on the way up. My build, despite an all-carbon ENVE cockpit, carbon wheels, and SRAM Eagle XX1 drivetrain, came in at just under 29 pounds. Not awful, but it’s a weight more in tune with today’s 150mm class of bikes. Which brings us to another issue with the Evil Following MB. Setup requires patience and experimentation, and ongoing diligence. Evil offers two settings, low (67.4 head angle w/130mm fork) and x-low (66.8), but switching between them isn’t trivial, requiring removal of dog bones on both sides, 10 bolts in all. X-low slackens the head and seat angles, lengthens the wheelbase slightly, and lowers the bottom bracket, stretching the overall handling. The change is noticeable, but not in my opinion transformative. 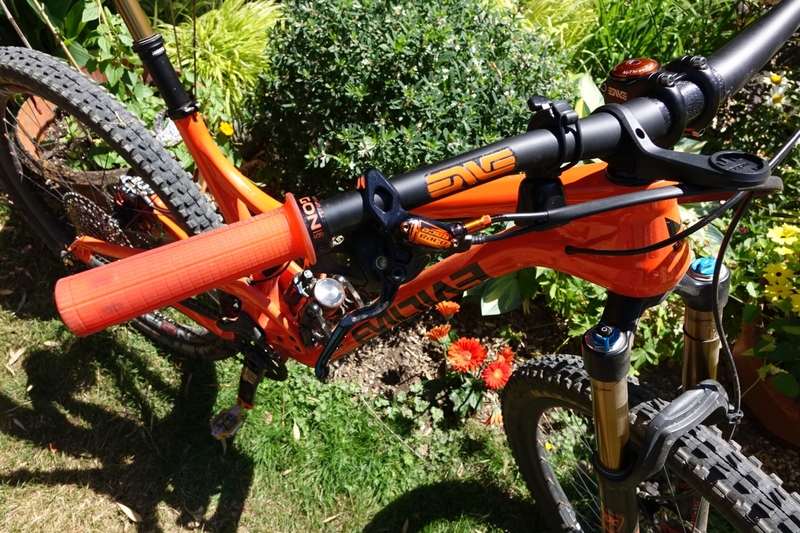 RockShox’s Super Deluxe shock setup also required a number of passes. Experimenting with different tokens and settings made the bike feel either sketchy or sluggish. Geared up at 185 pounds, I finally settled on the stock tokens, 245 psi, and just 3 clicks of rebound with low-speed compression wide open. As always setting may vary, but I’m listing these specs primarily because none except the pair of tokens falls within the manufacturer’s suggested guidelines. It also doesn’t help that simply adjusting sag is a pain due to a hard-to-reach O-ring. On the mechanical side, a lot is going on around the bottom bracket. Look at all those bolted contact points (18 total) in the region that gets the most lateral stress. My tester Evil Following MB developed severe creaking after about a month of riding. Various efforts at lubing pivot bolts, checking shock mounts, and so on amounted to a hill of beans. I then took it to an Evil-authorized local bike shop and they basically took everything apart and cleaned it. The shock was removed and contact points re-greased. A dab of blue Loctite on everything. Remember, the bike was basically still brand new. Getting shreddy in the Pacific Northwest, birthplace of the the Evil Following MB. I’m not alone in this. I know Evil owners who basically have taken their bike completely apart — several times — in search of squeaks and clunks. Bottom line, the Evil Following MB is temperamental and in a class of its own, which often translates to high maintenance. So be forewarned: If you neglect this bike, you face epic fails, including shock and even frame-parts replacement. 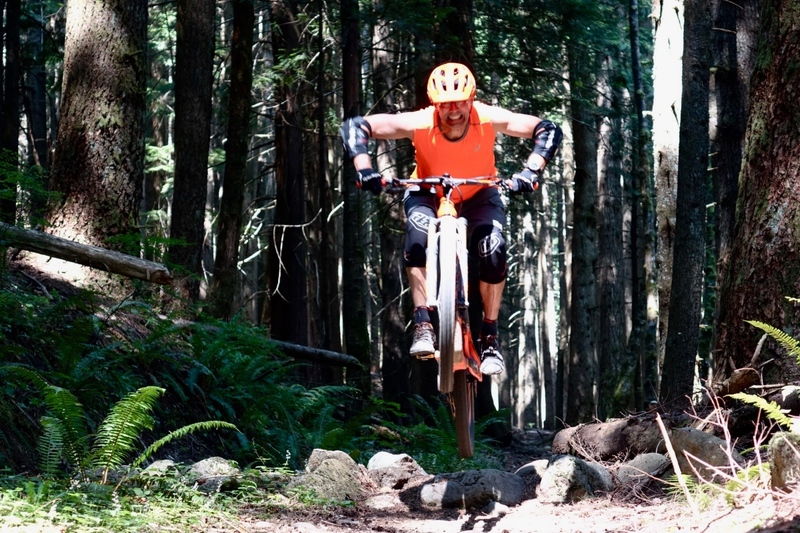 Current mountain-bike geometry, responding to more challenging trails and enduro-style riding, is trending toward stretched out, forward-leaning positioning — factors that increase confidence and stability, particularly at speed. In this universe, the Evil Following MB has some blind spots. But nothing matches this bike for what it is — a uniquely versatile, hugely fun experience. No mountain biker should go through life without sampling the Evil voodoo. The MB can do so many things so well, it finally answers the question, is there one do-everything bike? No, there isn’t. But Evil’s Following MB at least makes you think hard before responding. Frame and shock start at $3099. Color choices include smashing pumpkin (pictured) and drunken olive. Key features of the Evil Following MB.